A cup of tea and a hank of line. A few mornings ago, the Girl and I headed over to Edgewater Park on the Skagit River for an outing. We walked the perimeter of the park on both sides of the bridge (there’s a pedestrian underpass at the bridge abutment on the west side). The Girl was on squirrel patrol — gotta keep those bushytails at bay! She chased a couple of them, which gets her a good sprint into our walks. It occurs to me that I should practice calling her off when she turns on. It would be a good skill for her to have — return from pursuit on command. I’ll add that to our practice routine. It will be fun, even if she doesn’t want to give up the chase. Breakfast was good. While I ate, I put water on for a cup of tea. I made a nice cup of Earl Grey in my Yeti mug. 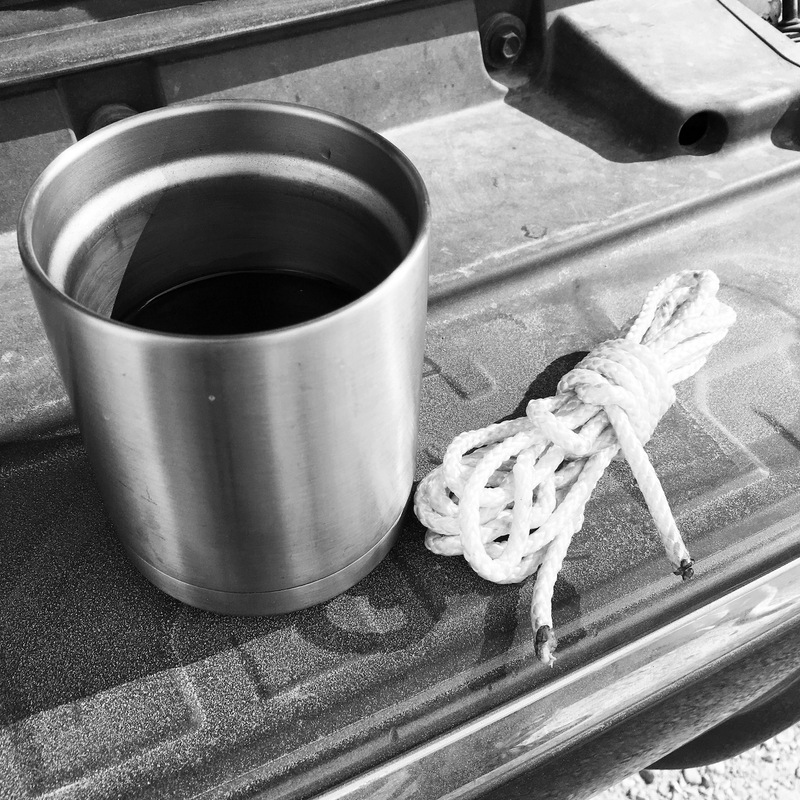 While drinking my tea, I cleaned up a hank of rope I keep in the tail net of my rig. Sometimes I need a bit of rope to secure something. The hank had loosened in all our travels. So, I cleaned up the frayed end, made a figure-eight coil, and tied it off with a clove hitch. I liked the package, so I put it together with my mug for a still life. LOL! There’s plenty of 550 Paracord in the kit. But I have some heavier line for loads not amenable to 550.